What could be more fun and meaningful than attending a party that highlights animals that needs homes and veterinarian services with an opportunity to support the local organization, The Pixie Project, that helps them in so many ways? The annual Pixie Party did that and more this past Saturday night at the Yale Union in Southeast Portland. Built in 1908 as a commercial laundry building, it now houses artists and a large event space. Over 300 guests attended the event, bid generously in both silent and live auctions, ate delicious paella and heard stories of cats and dogs that have been served by Pixie all around Oregon and Portland. Auctions For Good couldn’t have been more proud to serve as the benefit auction company for the 2nd year working with this wonderful organization. At Pixie, we make animal adoption and rescue a fun, family friendly, and positive experience. Our dedicated staff focuses on finding life-long matches between pet and adopter and takes a hands-on, personal approach to each and every adoption. Pixie is committed to keeping pets healthy, happy, and in their homes for life. Our on-site clinic offers low-income and homeless pet owners access to vital veterinary care and low-cost spay/neuter surgeries, keeping pets out of shelters and saving lives. Thank you to all the guests for your support! Kudos also go out to the many volunteers, donors and many others that made this event a success. Looking forward to seeing you all again next year! Thank you to Our Clients and More! We are off to a great start this year! The Spring benefit auction season passed with a flurry of successful events, and as we work on Fall event planning I am always heartened by the variety of organizations and schools we work with and all they do for our communities. And yes, there are seasons to the benefit auction world - they generally take place at two times of the year: Spring and Fall. We are busy working throughout the summer with our clients who are planning their fundraisers in the coming months! As a Benefit Auction Specialist, I have the pleasure of working with mission-driven organizations across the region. Here are just a few of the dedicated groups we've worked with so far this year. Click on each link to learn more about the work that they do! I want to thank each and every client for your business and the opportunity to get to know and work with you - you make this business meaningful and fun! I also want to introduce and thank Kelly Fitzgerald, a friend, who in the last eight months has helped out with marketing at Auctions For Good. Originally from Seattle, she has lived in Portland for the past 17 years. She has an impressive resume - with skills in project management, marketing, and extensive experience in the food and wine business. All her experience and skills have transferred nicely to benefit auctions. While I provide content for our emails, it is Kelly that makes them look great. She makes sure they are formatted correctly, adds graphics when needed, and proofreads them to ensure they are sent out looking fantastic. Thank you Kelly, for all you do! We are looking forward to the busy Fall auction season and working with past and new clients this year. We still have a few choice weekend dates available, so please contact us if we can be of service - I'd love to hear more about the work you do in the community and offer ideas on how we could boost your bottom line this year. Auctions For Good assists clients in all aspects of benefit auction planning - we are dedicated to working with with nonprofits and schools across the region. As a Benefit Auction Specialist, I enjoy working with mission-driven organizations to maximize their fundraising goals! • Do you need help with your upcoming benefit auction? • Thinking about how you can engage more deeply with your audience and supporters? • Interested in learning how we maximize fundraising for schools & nonprofits? Benefit Auctions ~ Connecting People with Purpose! Auctions For Good is looking forward to helping out Taborspace again this year! Their first auction fundraiser exceeded expectations and planning for their 2nd Annual event is underway. Come and check it out if you can. It's located close to Mt. Tabor in SE Portland and we'd love to see you there and support efforts to preserve their 125 year old building. BAS Designation - What is it and why is it important for nonprofit fundraising? ...what is the BAS designation & how does it help our organization? The BAS designation is a professional designation awarded by the NAA (National Auctioneers Association) Education Institute. Professional auctioneers that have advanced through their program utilize specific planning techniques, marketing skills, and targeted business strategies to create successful benefit auctions for their clients that maximize profits and build their client's donor base. In order to be designated as a BAS, auctioneer-scholars are required to complete 21 classroom hours, a detailed written auction summary report, proof of at least 6 benefit auctions and 24 hours of continuing education every three years. Mitch Lambley founded Auctions For Good in order to further his dedication to working with mission-driven organizations. Mitch considers the decision to pursue the BAS designation as one of the best choices he’s ever made. The specialized skill set and ongoing education with the NAA Education Institute enables Mitch to provide greater value to every one of his clients, while engaging and entertaining an audience and putting on a great evening. As a Benefit Auction Specialist Mitch is able to boost the fundraising efforts of non-profits and schools in substantial ways! The Royal Rosarians As the official greeters and ambassadors of the city of Portland, established in 1912, the foundation supports many youth oriented organizations such as the Community Transitional School, Christmas for Kids, Oregon Pro Arte Youth Orchestra, and the Royal Rosarians Field Trip program. MIKE Program Multidisciplinary Integrated Kidney Education - providing health-science education for underserved children in Portland. Peace In Schools A one-of-kind organization offering mindfulness and meditation classes in three quarters of Portland high schools with the goal to offer their program in all Portland public high schools in the future! Multnomah Playschool A parent cooperative pre-school (and the oldest pre-school in Portland); they raise fully one half of their operating budget at their only fundraising event each year - their annual auction. Northwest Indian College The only accredited tribal college serving Washington, Oregon and Idaho. Pacific Crest Community School A unique, small alternative middle through high school where individuality and community are top priorities and students have a direct voice in their education. About 80% go on to college. Why is hiring an auctioneer with this designation important to your organization or school’s next fundraiser? Hiring a BAS auctioneer starts you on a path to success for your next event. Whether it’s your first or 10th annual event, when you hire an auctioneer with this training, you will immediately notice an approach and value you may not have expected. The following are areas where a BAS auctioneer can offer great assistance. Creating a silent auction strategy that will make this part of your event shine! I was attracted to becoming a benefit auctioneer because I liked the idea of people gathering for a big party to support a cause. Selling household items, cars, or equipment for the sole sake of getting top dollar never interested me. But putting on a great show, offering a nice meal, fun entertainment and engagement with an audience to support an organization or school? Now that's fun and meaningful! I am personally motivated by any nonprofit that benefits the needs of children, and at Auctions for Good we love supporting all organizations that are making a difference in our community! What will hiring a BAS auctioneer cost? Most auctioneers that specialize in benefit auctions charge a flat fee. Some charge on a percentage of sales based on those areas in which they are involved, and others structure their fee as a combination of the two. As in many professions, a range of fees exists and doing your homework by interviewing auctioneers in your area is important in order to determine who will be a good fit for you and your budget. Auctions For Good works with many types of organizations and we charge a flat fee for our services. We generally charge less for schools than nonprofits since they are volunteer instead of staff-run and typically have smaller budgets. Contact us to learn more about the services we offer and how we can help you. Bottom Line: Compare costs, services offered, experience, availability, style, and personality of the auctioneer to determine who is a good fit for your audience and mission. You most likely will be very happy having chosen a true benefit auction professional that has your organization’s goals and interests at heart. Good luck! Connect With Us Here - We Can Help You Reach or Exceed Your Goals! Auctions For Good was honored again this year to serve as the auction company for the Northwest Indian College's annual Cultural Art Auction and Benefit Dinner. This was our 5th year working with this great school and foundation. The venue for the event changes each year to allow different northwest tribes the opportunity to host and this year it was at the Suquamish Clearwater Casino Resort, just North of Bainbridge Island, WA. The college is the only regional tribal college in the United States and the only accredited Tribal college in Washington, Oregon and Idaho. It serves more than 120 tribes across the country. Here are a few pieces of art that were up for bid along with other images from the evening. If you love Native American art, you may want attend this annual fundraiser, always held in mid-April, where all live and silent auction art pieces are made from members of various tribes. 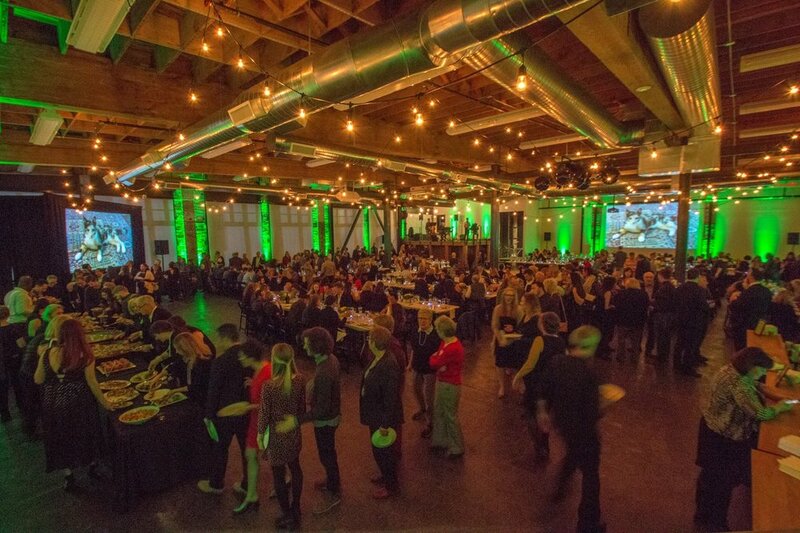 If you are a small nonprofit or school looking to hold a fundraising event in the near future, you may want to check out a relatively new option available in Portland, the Lagunitas Brewing Company Community Room. I visited it just yesterday and was impressed with the space, the heavy and beautiful wooden tables, and the staff! The Community Room, located on northeast Broadway is available at no charge to nonprofits and schools only, with the 501c3 organization designation. As a way for Lagunitas to give back to a community in which they do business, they opened their community room in 2016. Karen Hamilton, Director of Communications for the company based in Petaluma, California, said the space will be "completely donated to any bona fide nonprofit organization so that they can focus on raising the funds they need to carry out their respective missions." "We believe that beer is the original social media and we know that the best way to connect with beer lovers is face to face, over a beer," Hamilton said. Auctions For Good works with groups of ALL sizes and would love the opportunity to work with you at this venue. Contact us and we'd be happy to visit it with you to discuss your fundraiser. ...how a meaningful gesture made a lasting impact! Acknowledging and thanking donors, sponsors, and guests is an important part of any fundraising event. It shows how much you appreciate their dedication and contributions to your cause, and strengthens these beneficial relationships in the years to come. Auctions For Good recently had the honor of working with a great organization called The Pixie Project. They exemplified a fun and authentic way to show gratitude to their successful bidders. With a personalized touch from Executive Director Amy Sacks, The Pixie Project raised guest appreciation to a new level! During the live auction at The Pixie Project's "Pixie Party" Amy Sacks quickly confirmed the winner after each auction item was sold, ran over to them and gave them a big hug and personally thanked them for supporting Pixie! I was elated and stunned! Amy Sacks on the left, encouraging guests to support Pixie Project. We often see guests and donors thanked by listing their name in the program, displayed on screen, or by verbal announcement at the event itself. At the Pixie Party, Amy went above and beyond by connecting with each winning bidder personally; she showed them - and the 350 attendees in the room - how much their support meant to her and the entire Pixie Project organization. By seizing the opportunity to express gratitude in this delightful and meaningful way, Amy made a lasting impression that deepens the ties between The Pixie Project and their benefactors. I believe diehard Pixie fans are in part won over because of this kind of gratitude and passion, along with the great care they show the dogs and cats that spend time in their facility. My message to you while planning your next event: consider unique ways to demonstrate gratitude for your guests - when you strengthen your connection to your community, you'll grow dividends for your cause. Show them how you care in a big and public way. This display of gratitude doesn’t have to come from the founder, or others at the top levels of an organization or school. It can come from a volunteer, a staff member, or a parent from the PTA - but the point is to do it. Your guests will be in awe and will love it! You’ll win fans who will become devoted supporters. At Auctions for Good we work with our partners to spark these moments of meaningful connection - they are the foundation for building lasting, beneficial relationships within our community. If a hug isn’t your thing for those winning bidders, try a bottle of wine, a bouquet of flowers, a fantastic dessert, or a special gift commemorating your event. Make it yours, make it special, and you’ll be glad you did. Let's connect and talk about the many ways that you can wow your guests at your next fundraising event!